Rugged + Smart + Curiority, natural instinct of any man. At a young age, a man will take the risk in any form to have that edge of continuous adrenaline flow as hard and fast as a river. Whether its rock climbing, desert adventures, dangerous escapades, a true man will overcome every obstacles, strength and fear. Some say man such as these are suitable life partners. 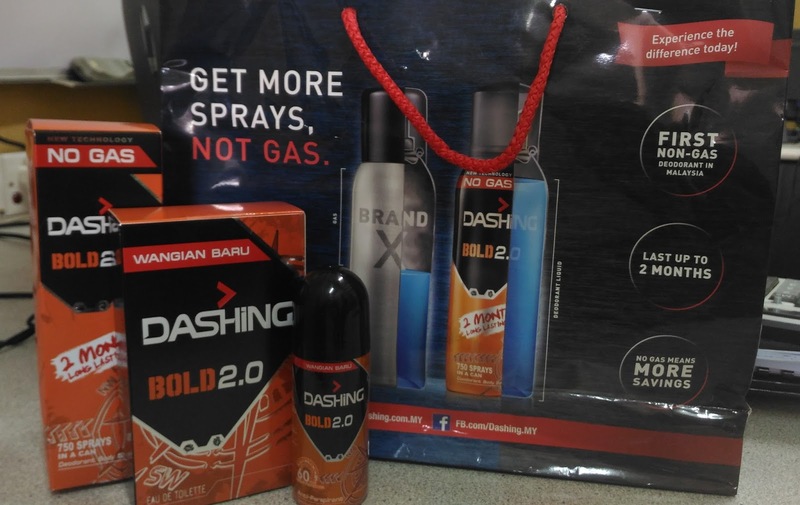 DASHING being a brand that portrays itself as casual, fun and confident lifestyle, making sure that it is in the life of every Malaysian man. With that DASHING proudly re-launch their ADVENTURER collection that ranges from deodorant, EDT and Roll-On Perfume. The new formulated smell and freshness longer lasting, especially those who are active. DASHING introduce 2 products, first in MALAYSIA 'NO GAS' Spray. Has an of freshness of aquatic, freshness and masculine that is suttle on the nose to smell. Suitable for man that loves adventures in their life most of the time. Most suitable for the younger generation of man, as they venture out to find their own passion. 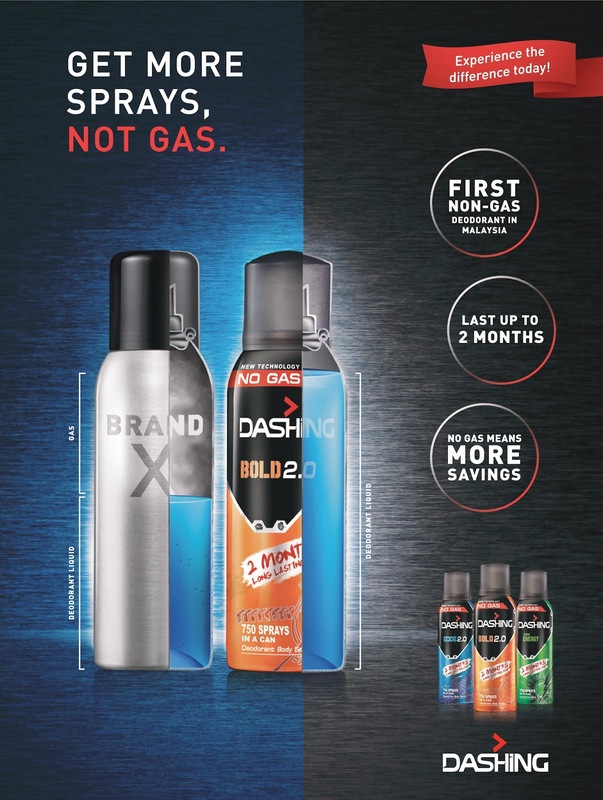 Difference with the conventional deodorant spray that last about 3 weeks due to daily usage, 'NO GAS' has pure original deodorant that is compact and gives out 750 spray every bottle and able to last until up to 2 months. Besides the benefits of 6-in-1, and smelling good, it saves cost on the pocket size as well. DASHING is always looking to improve, caring for your daily needs, and proud to be the pioneer in 'NO GAS' deodorant spray. With twice the action, through this one can keep and pamper oneself all the time through DASHING ADVENTURER quoted En Venkat Jangam, DASHING Marketing Manager. The new packing of DASHING ADVENTURER ranges from different vibrant colours and looking premium. The uniqueness and a touch of 3D gives that look that will attract exclusively for consumers. EDGE 2.0 - is specially designed with a 4x4 tire track to symbolized extreme sports suitable for those who are into an adventurer. DASHING ADVENTURER comes in blue, orange, red and green packaging. Since 1980, WIPRO UNZA Group has successfully build up a portfolio with product ranging from personal care to household items in Asia. Holding brands such as ENCHANTEUR, SAFI, EVERSOFT, DASHING, CARRIE, ROMANO and VITALIS for personal care, VIGOR and MAXKLEEN for household items. For more information, may visit the links provided FB Dashing, Twitter Dashing, and Official Website.